www.racerxonline.com You couldn’t find two Nationals anymore different than Unadilla and Utah. One is old-school, east coast, with big jumps carved by nature and an ever-present threat of rain and mud. The other is all-new, out west, with man made jumps and a threat of dust and wind. One track sits in a sleepy little village with a barn as a roadside landmark; the other is a multi-million dollar playground. Everything and anything about these two races was different, except for one thing: Ryan Villopoto and Eli Tomac dominated. Really wasn’t much different at all. Now those two have wrapped both titles early, the first time since 2008 that neither championship has gone down to the last round. Many elements changed, but the Ryan Villopoto and Eli Tomac standard of excellence did not. And that’s because, no matter where or how it’s done, you can’t change one thing: motocross is hard! Motocross is freaking tough, and that’s the way we like it. It’s the known risk, the price of entry, and the reason we secretly feel, deep inside, that anyone who doesn’t get this sport doesn’t know what they’re missing. I can’t think of another sport that so deftly combines two sciences together in a competitive environment. In motocross, you’re dealing with a dynamic combination of athleticism (riders) and mechanical engineering (bikes). Motocross sits just below the ultimate threshold of both facets. Pro cyclists or Olympic athletes might be even stricter with fitness, but not by much. A stick and ball sport might put a slightly higher focus on a specific athletic skill, but not by much. Formula 1 or MotoGP might be more advanced mechanically, but motocross teams are pushing pretty hard, too. Dig deeper, try to find an endurance sport that asks 30+ minutes of high heart rate without rest, but also adds a strength, agility and balance quotient. In most endurance sports, enduranceis the sport. In motocross, it’s the just the base element in what is really an athletic skills competition. Then you throw in a factor rarely experienced in other sports—the danger factor. Ryan Villopoto can make the toughest sport look like the easiest. Motocross is downright scary. Anyone who has ever thrown a leg over knows that things could go bad any time. There are nerves and pressure and fear that are very real in this game. I gather that every athlete gets nervous before a big game or race or match. The fear of performing badly is enough to fuel that. In moto, there’s a fear of losing, too, but also a fear of losing it all. Stick and ball sports usually don’t cause broken bones on the level of moto, and while auto and motorcycle road racing can produce tragic consequences, the day-to-day fear of getting injured (i.e. broken bones) is minor. 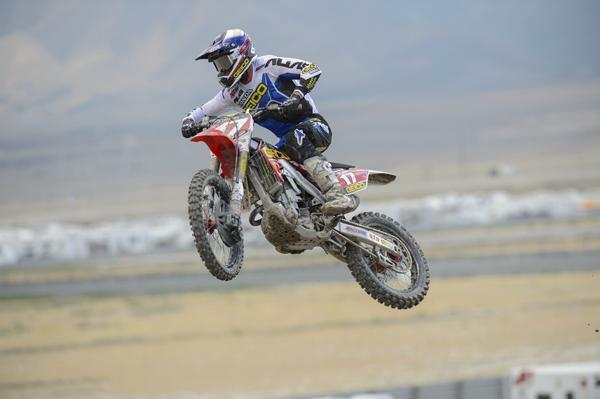 A top motocross rider is on that bike four to five days a week, and can wreck himself during any one of them. NASCAR people are still talking about Tony Stewart breaking his leg. That’s practically a weekly story in motocross. This super multiplier of elements—physical, mental, mechanical—adds up to a challenge unlike anything on earth. That combination is so hard to get right, that when stumbled on, it becomes almost unbeatable. That’s where Villopoto and Tomac are right now. Throw in different tracks and weather and dates and coasts—they still can’t be topped. They say that easy tracks create a level playing field. Well, so do easy sports. The most difficult sport creates a chasim rather than a level field, and motocross’ combination of athletic talent, skill and endurance, multiplied by the variations in equipment, multiplied by the mental factor of simply overcoming fear makes it nearly impossible for several athletes to arrive at the same performance level every weekend. We like motocross because it’s hard, but that extreme level of difficulty often blocks something we really want to see: close racing. When one rider is better than another, it really, really shows. It always has, and it always will. NASCAR has done a good job of spec racing the series down to where the entire field runs in packs, and anyone can win. Cars are so critical you can tighten up the rules and tighten up the racing. You can’t do that to a track filled with ruts and jumps and bumps, and fitness and health and confidence play such a factor. It also creates other problems. We ask a lot from our heroes. We ask them to grind all week, to battle hard on weekends, to be available to fans and media and sponsors and promote the sport for all of our benefit all of the time. But the sport itself makes it difficult. Heck, think of how nervous you are on race day when there’s nothing more on the line than bragging rights. Imagine how nervous you’d be racing for much higher stakes—to make a living—while also dealing with everyone’s greatest fear, public speaking, all in one day. There’s a travel grind here to match the toughest in most fields. There aren’t many home games in this sport, plus, the off-season is extra short and filled with obligations, as well. It’s a chore to practice motocross, yet just easy enough where it’s doable everyday. Race drivers literally can’t practice in a car on a track everyday, so they’ve got time for autographs and commercials and media if they want it. But motocrossers can ride and train every day, so they do. But it’s not easy, certainly not as easy as going to the gym or the ball park. There’s serious effort behind loading up, gearing up, get the bike running and then riding, all while pushing that fear to the side. 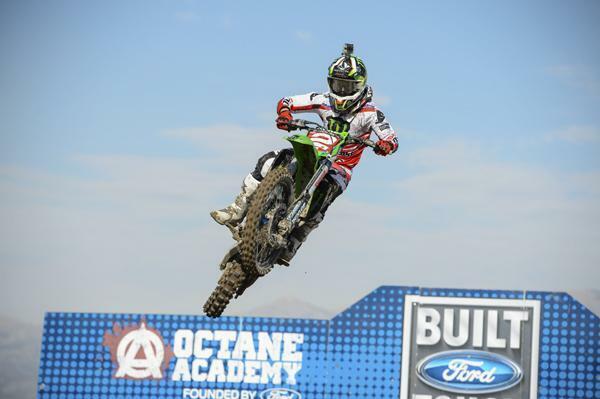 From a young age, riders like Eli Tomac (above), are expected to represent companies on and off the track in a good manner. Motocross requires such skill that it skews young. Other sports can be pursued in spare time in and around a school schedule. Riding is too difficult, the skill level required to win needs hours of practice at a very early age. That leads to home schooling and extreme pressure and travel and monetary demands on kids. It’s why the heroes of our sport are expected to be polished, media savvy sponsorship spokespersons in their prime, say, age 22, while most top pros in other sports don’t grab that mantle until around age 30 (and by then, many have a college degree). These days, many are chalking up the many faux paus of freshman year Heisman Trophy winner Johnny Manziel to his young age. He will turn 21 this year, the same age Ryan Dungey, Ryan Villopoto, James Stewart, Ricky Carmichael and James Stewart were all battling for their first AMA Supercross championships in the premiere class. They were expected to put the weight of their professional sport on their back. Then, we make fun of their boring interviews or lack of media polish. You’re asking for a lot. We’re always asking for a lot. We’d love to see closer racing, more jousting between riders, more personality, more time for fans and cool views within the sport. But we’re also asking an athlete to succeed in the hardest sport in the world. And that’s hard enough.